Deep Transcranial Magnetic Stimulation (dTMS) is a non-invasive treatment for depression. It works by applying brief magnetic pulses to the brain. These pulses create an electric field which has been shown to produce excitations and/or the inhibition of neurons deep inside the brain. Our therapy is referred to as “Deep TMS” because, unlike traditional TMS therapy, Deep dTMS reaches into the deeper (limbic) areas of the brain that impact mood regulation and motivation. The Brainsway Deep TMS System is cleared by the U.S. Food and Drug Administration (FDA) for the treatment of depressive episodes in adult patients suffering from depression, and who have failed to achieve improvement from anti-depressant medication. While U.S. clinical studies are currently underway for a number of additional disorders, dTMS has already gained CE approval in Europe for the treatment of bipolar disorder, PTSD, chronic pain, OCD, adult ADHD and other addictions. What will I experience during dTMS treatment? 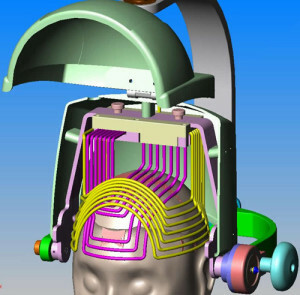 During the first treatment, a clinician will place a magnetic coil, which looks like a helmet, over your head. They will then calibrate the intensity of the magnetic pulse based on your individual requirements. You will hear a clicking sound and feel a “tapping” sensation on the scalp. Follow up treatments will generally require 17-30 minute sessions daily Monday through Friday over the course of four to six weeks. Are there safety considerations due to the magnetic field used during treatment? Yes. 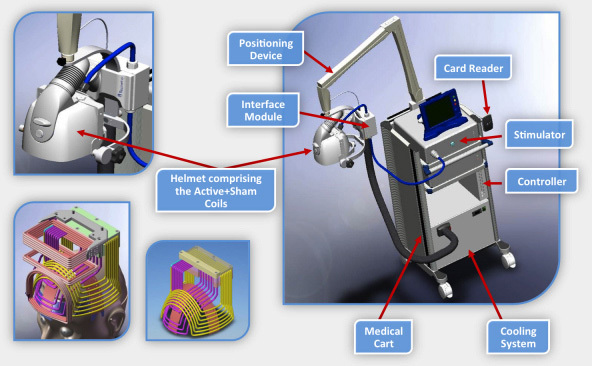 TMS Therapy should not be used in patients with implanted metallic devices or non-removable metallic objects in or around the head (for example, metal plates in the skull, aneurysm coils, etc.) because serious injury could result. Patients with braces and metal fillings are acceptable for treatment; however, patients with other metal within their mouth should discuss this with their physician. 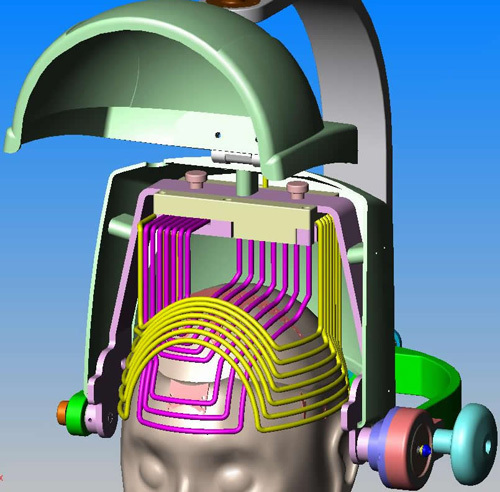 TMS Therapy should not be used in patients with implants controlled by physiological signals. This includes pacemakers, implantable cardioverter defibrillators (ICDs) and vagus nerve stimulators (VNS). A history of a seizure disorder is generally a contraindication to deep TMS. Are there side effects to dTMS treatment? dTMS Therapy has been demonstrated to be safe and tolerable. No side effects such as weight gain, sexual problems, stomach problems, sleepiness, or dry mouth were seen during trials. There were no negative effects on memory or ability to concentrate.